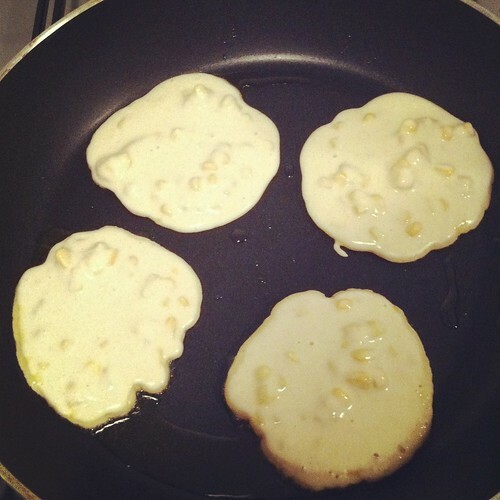 Are they fritters or pancakes? I'll be damned if I know. I wasn't going to post these (hence the terrible photos), but someone on twitter asked if I would - and I'm totally swayed by even the merest hint of flattery - so here you go, people. Seriously. Toast, spread with a bit of butter, a sprinkle of salt and a squeeze of lemon and ay, caramba! Originaly we ate these with salmon, an avocado and spring onion salady thing, and a bit of crème fraîche. They go great with Mexican/Caribbean/Deep South BBQ style food - jjalapenos, cheese, sour cream, lime, ribs, jerk chicken, all that sort of stuff. Proper feasting. God, I'm starving again just thinking about it. 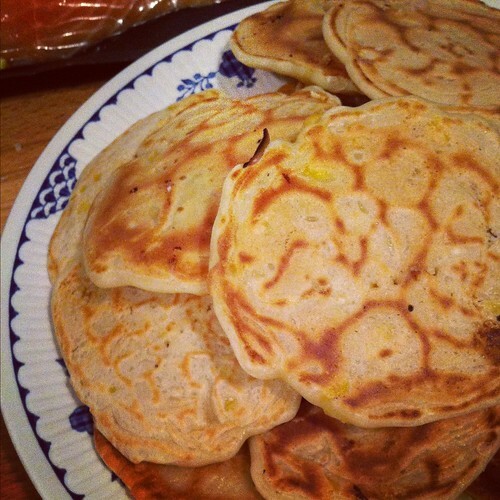 Mix together the milk, flour, eggs, seasoning and baking powder and stir until you have a smooth but quite thick batter. Then stir in the sweetcorn (if you're using frozen it might stick together, so make sure to break up any lumps). Heat a non-stick frying pan to a medium-high heat and spoon the mix into the pan, to make whatever sized fritters you desire. If you have a good non-stick pan you shouldn't need any oil, but if you really need it use a teeny tiny bit - not too much as it just gets soaked up and the fritters get a bit saturated. Also if they're really oily they might set your toaster on fire the next day (I don't know if that's true but I've got OCD so I want to warn you JUST IN CASE). They'll generally need a couple of minutes on each side. They'll look a bit sicky at first, but have faith. Flip them over when they start to go golden, then when they're done keep at a low heat in the oven, whilst you do the rest of the batch. Never in my wildest dreams could I have imagined toasted sweetcorn fritters. Fantastic. They are an utter joy! I made a load yesterday and had two toasted in the toaster this morning. I could eat these every day. The toaster did not ignite either. I am very reassured to hear this.